In November 1966 an event occurred in the sleepy little town of Point Pleasant, West Virginia about which the whole world would eventually learn. A mysterious winged man, later dubbed the Mothman, appeared that winter night. He would plague the people of Point Pleasant until mid-December of that year. Two couples, Roger and Linda Scarberry and Steve and Mary Mallette were taking a late night drive on the night of November 15, 1966. As they passed the abandoned West Virginia Ordnance Works factory, they noticed two red lights near the factory gate. Curious, they stopped and found the eyes to be that of a large animal. They later described him as something that looked like a man, but was at least 61/2 feet tall with wings on his back. They drove off, but the winged man followed them, even as the car reached speeds in excess of 100 miles per hour. They drove directly to the Mason County courthouse and spoke to the deputy there. He followed them back to the site, but the creature was gone. The next night, more townspeople reported seeing the red-eyed flying creature. The sightings continued, in not only Point Pleasant, but Charleston and Mason, West Virginia as well. Eventually, there were over twenty-six credible sightings reported in less than a month. But other odd things began happening as well. Televisions flickered with static, phones were filled with strange noises and static, there were reports of UFOs and poltergeist activity in the area. Perhaps what helped perpetuate the legend of the Mothman is the collapse of the Silver Bridge on the Ohio River. The bridge, connecting Point Pleasant with Gallipolis, Ohio, collapsed on December 15, 1967, killing 46 people. Later investigation showed that a single eye-bar in the suspension chain had failed, due to a manufacturing flaw. But the townspeople began to believe the Mothman had come to prophesise the tragedy. After the collapse of the bridge, all the odd happenings and sightings of the Mothman in Point Pleasant ended. The Mothman has also been seen in other cities around the world. People in China, the former Soviet Union, Chili, Mexico, India, and several countries in the Middle East have reported seeing the Mothman, usually before a tragedy occurs. Eyewitnesses say they saw him in 1986 in Chernobyl, right before the nuclear disaster. Others say they saw him in Tbilisi before a large earthquake in 2002. Is the Mothman a real prophet of impending doom? Some simply think the Mothman was just a large bird, perhaps a sandhill crane or snowy owl. Perhaps it was a cryptid, a real animal that has yet to be correctly identified. John Keel, author of the book The Mothman Prophecies, seems to think he was an ultraterrestrial creature from another dimension. Could the Mothman have been some type of government experiment? Maybe it was just the result of mass hysteria on the part of the people of Point Pleasant at the thought of some strange creature stalking their community. Some in Point Pleasant have been able to capitalise on his legend. 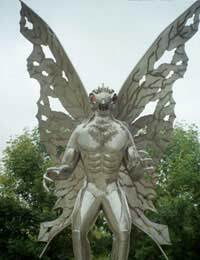 The Mothman Museum opened in 2005. It displays props from the 2002 movie “The Mothman Prophecies” starring Richard Gere and Laura Linney. It also has all types of Mothman souvenirs including t-shirts, books, DVDs, even Christmas ornaments. For the past six years, Point Pleasant has held a Mothman Festival. The festival is free and features guest speakers on topics such as the filmmaking, the paranormal, and actual Mothman witnesses. This past year, the Mothman Band played in Mothman Park near the 12-foot tall Mothman statue. Regardless of whether the Mothman is real or not, his legend lives on.